The benefits of balancing your body's pH by drinking alkaline water are well known: It boosts your energy levels, contributes to the elimination of toxins from your body, protects your healthy cells by fighting free radicals, increases your body's ability to stay hydrated and replenishes minerals and electrolytes that are important to your health. Two important factors to consider when researching the best water ionizer for your home are the design of the plates (also know as electrodes) and the number of plates in the machine. Platinum coated titanium plates are the best and most durable, and the more there are plates in your machine, the bigger will the total ionization surface offered by the plates be, and the larger the ionization capacity of the machine. Usually, bottled water is made alkaline with mineral or chemical pH buffers added to the water, where as water ionizers make alkaline drinking water naturally, with no added chemicals. Bottled alkaline water loses very fast its antioxidant value and has a positive ORP, where as water ionizers can make alkaline drinking water with a high negative ORP (please see Note 2 in comparison table below for an explanation of ORP). Bottled alkaline water will cost a lot more than ionizer produced alkaline water. That is partly because of the cost of the work and materials that go into making and transporting bottled water. Finally, by making your own alkaline ionized water you will be contributing to the reduction of waste materials. This article will compare countertop water filtering and ionization systems Air Water Life Aqua and Tyent MMP-11 which are very popular among Amazon buyers and widely considered as some of the best available on the market. At the time of this writing, both had received an average rating of at least 4 stars out of 5 stars: 4 stars for Air Water Life Aqua and 5 stars for Tyent MMP-11! Selected Water Ionizers on Amazon. Both machines considered here are equipped with hard or touch-screen buttons that have pre-programmed water pH ionization levels. Please see Note 6 for more details on the pH levels that can be achieved with these machines. ORP is the measure water's healthy antioxidants level. When a liquid has a negative ORP, it is able to neutralize free radicals, and uptake rogue oxygen atoms that may damage healthy cells in the body. On the other hand, positive ORP will cause excessive oxidation, and harmful free radicals in the body. Negative ORP is highly reactive, and dynamic, and does not “stay” in solution for more than a few days before returning to a neutral or positive state. This is why most bottled water actually has a positive ORP and contributes to oxidation, and why ionized water is best consumed immediately after it’s produced, before it ‘goes flat’ and loses its antioxidant qualities. Plates (or electrodes) provide the ionization surface. Therefore, the bigger the total surface offered by the plates of an ionization machine is, the larger will the ionization capacity of the machine be. Air Water Life Aqua is equipped with 7 ionization plates made of durable, energy efficient, multilayer, platinum coated titanium. They offer a total ionization surface of 114.8 sq.-in. ​Tyent MMP-11 is equipped with 11 huge solid/mesh hybrid medical grade, strengthened titanium plates, dipped multiple times in platinum. They offer a total ionization surface of 385 sq.-in. Air Water Life Aqua 7.0 is equipped with an activated carbon filter that gets rid of bad taste and odors. It also removes chlorine, benzene, trihalomethane, radon, pesticides, VOCs and other harmful pollutants found in tap water. Because the unit is self-cleaning, a single filter will clean over 6000 liters/1585 gallons of water which is good for about a year of average use. It is recommended to change this filter once a year. The machine's LED screen indicates when the filter needs to be replaced. ​Tyent MMP-11 is also equipped with dual carbon activated filters with 0 .01 micron ultra filtration capability. These filters remove contaminants such as sediment, chlorine, chloramines and heavy metals. A third party laboratory has also confirmed that they also eliminate hundreds of other poisonous toxins including herbicides, pesticides, pharmaceuticals and much more. The .01 micron ultra-filtration level found in these filters is the same as what is used in kidney dialysis machines and can even filter heavy minerals and bacteria. The machine's touch-screen is equipped with two icons that let you know when each of the two filters need to be replaced. Important Note (for both ionizers ): If you live in an area where there is no potable tap water supply, and you are using poor quality water from other sources such as wells or rivers, installation of additional filters in line between the water source and the ionizer may be required to get rid of the additional harmful pollutants such as bacteria and viruses that may be found in such waters. ​Tyent MMP-11: When cleaning is required the touch-screen will start flashing back and forth between red and purple. You can run the cleaning cycle by simply touching the RTR icon on the touch-screen. With Air Water Life Aqua 7.0, you select the pH level of the water based on what the water will be used for. - There is also a neutral pH level button that produces simply purified (filtered) water with no ionization done (averages 7.0 pH). - The WASH button is used to initiate Enhanced Cleaning of the machine. ​- The SET button is used to set the Enhanced Cleaning parameters that affect the cleaning frequency. ​​Note: To avoid any accidents and malfunction, you should always read carefully the user manual before operating any water ionization machine. ​A. Total Inflow Monitor: Displays the total commutative water flow through the water ionizer. B. Hydraulic Pressure: Reflects the unit's water ​ pressure and is displayed as Low, Moderate or High. C. Filter Replacement Alert: Advises the user when it's time to replace the Inner Carbon Filter. D. Water Flow Indicator: Rotates to confirms that inlet source water is flowing into the water ionizer. E. Purify, Electrolyze & Divide Monitor: This active display confirms your water ionizer is progressing through various water filtration, electrolysis and water separation stages. ​F. Alkaline Water Indicator: Confirms the water ionizer is dispensing alkaline water. G. Purified Water Indication: Confirms the water ionizer is dispensing purified, i.e., filtered but non-ionized, water. H. Acidic Water Indicator: Confirms your water ionizer is dispensing acid water. I. Washing Flasher: Lets the user know the water ionizer is in automatic cleaning mode. - For each of the above 5 selections, TURBO settings can also be invoked by pressing and holding the selection icons for a couple of seconds (instead of just touch and release). When TURBO settings are invoked, the machine uses the maximum available power to produce the strongest possible water of the type selected. - The H2O button is used to produces simply purified (filtered) water without any ionization. - F1 and F2 display the two filters' remaining life. They are also used to initialize the filters after replacement. - SET is used to adjust the preprogrammed alkalinity and acidity levels of each of the five PH selection buttons to the levels that you want. Because the mineral content in tap water varies across the country, you may need more or less power to create the same pH levels. That is why each of the alkaline and acidic preset icons can be adjusted so you can get you want at each preset regardless of the mineral content of the water coming out of your tap. - RTR is used to invoke the machine's cleaning cycle. Note that when cleaning is required the screen starts flashing back and forth between red and purple. - The TIME icon on the right hand side of the touch-screen is used for the automatic shut-off safety feature: If the machine is left idle for 15 minutes, it shuts off by itself. The TIME icon simply counts down to the automatic shut off. When TURBO mode is used, the machine shuts off only after 5 minutes. - The PH icon (just to the left of the VOICE icon) simply shows the alkalinity level selected, the middle bar indicating the neutral level. With Tyent MMP-11, when you select a particular pH level on the touch-screen the voice alert lets you know which pH level of water your unit is producing. The voice feature will also guide you and tell you when you need to change the filters, etc.. If desired, you can turn the voice alerts off by simply touching the VOICE icon on the control panel. Tyent MMP-11: Lifetime Warranty on parts and service. So which of these two Ionization Systems should you get? Air Water Life Aqua 7.0 is very easy to use, because the alkalinity and acidity level control buttons are named after the type of application they will be used for. If you want to use your water for cooking, you just press the Cooking button and the water will have pH levels suitable for cooking; if you want to use your water for drinking, just press the Daily Drinking button and the water will have pH levels suitable for drinking; etc. But note that, you can not modify the pH levels preprogrammed for each button. With Tyent MMP-11, the various touch-screen buttons are not named according to what they will be used for. They are simply named by the alkalinity and acidity levels they provide (Alkaline 1st, Alkaline 2nd, Alkaline 3rd, Acidic 1st and Acidic 2nd ). Therefore, before pressing a pH level button, you will need to know what pH level is best for whatever you'll be using the water for. On the other hand, Tyent MMP-11 allows you to modify the preprogrammed pH level of each touch-screen button so that you can increase or decrease their power if you are not satisfied with the preprogrammed pH levels. Another important difference is the filters these machines use: Air Water Life Aqua is equipped with a single carbon activated filter, while Tyent MMP-11 has a two-stage filtering system with two distinct carbon activated filters. 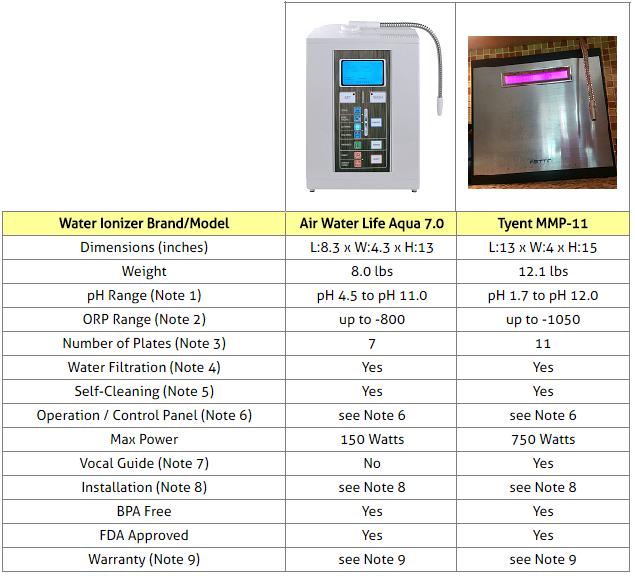 Though both machines will eliminate chlorine and bad odors from your tap water, if you live in an area where there is no potable or tap water, you might want to consider the Tyent MMP-11 ionizer which has filters with 0.01 micron ultra-filtration capability and can even filter heavy minerals and bacteria. ​But if your home has already treated tap water, either ionizer will do just fine regarding filtering. 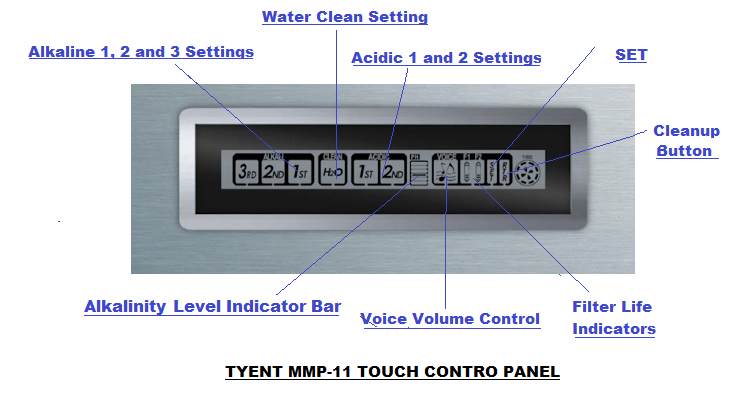 If you are looking for an ionizer with vocal guidance, then you should be considering Tyent MMP-11. Finally, one additional reason for the Tyent MMP-11 to be priced quite a bit higher is that it is a more powerful machine: It can achieve a power level of 750W as opposed to 150W for Air Water Life Aqua, and a negative ORP range of up to -1050 as opposed to up to -800 for Air Water Life Aqua.